Stained glass is an ideal way to bring color and style to your home. Make your escape to a private world filled with drama, beauty and romance with exceptional stained glass art from Stained Glass Inc. Put yourself in a majestic forest in the mountains or a beautiful tropical oasis. Each of our panels is artfully crafted with an amazing depth of translucent color and intricate detail work. Stained glass is perfect for your home, adding color and beauty in a unique, affordable way. All stained glass from Stained Glass Inc. is completely customizable. Choose a design from our huge design gallery or let us create something truly unique just for you. Our stained glass inserts are extremely simple to install and will look great in your home. Our inserts also offer extra insulation that saves on cooling and heating costs. 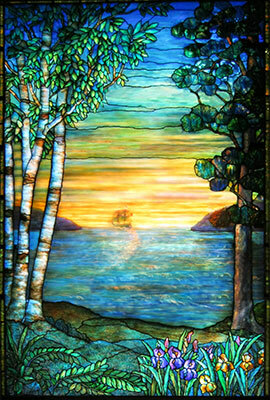 Let us make your stained glass dreams a realization and bring the fascinating appeal of stained glass to your home. Order your Stained Glass Today! Ready to order your stained glass? Call us. We are here to help.